I got to thinking about my planes scattered all over the shop… on shelves, in drawers, & here & there. I could consolidate their storage, get them all together, and make more overall storage space for other things! So, I grabbed some scraps and started out Mapping Out where the various planes would fit on the board. I screwed 1/4” ply 1/2” strips for separators, drew more lines, added more strips, etc. until done. I marked where little rare-earth magnets would go… drilled partial holes… and glued (J B Weld) the magnets into place. Mounted the Door Hinges to the top… ... tilted it until it looked good, to keep planes on it good. Installed bottom Stop to keep it at the desired tilt. Used a French Cleat on the end of steel Shelving to hang the unit! Works really good! It\’s nice to see them all in one place now! Now, I have to clean them up so they look nicer than they are… I have most of the blades, etc. Sharpened & tuned. I had this done several months ago… Finally getting around to posting it! Very neat idea, Joe. I also like the lower cabinet for what looks like router bits and some larger bits!! As you would say Joe “very cool”! However, I thought that these things were only to be seen in museums these days of thickness/planers, jointers and various types of sanders. Having said that, I do actually have ONE which I might use once every year or two! I have just gotten into using planes the past year or so. I only have 3 and they are in different areas of the shop. Maybe time to make something like this before the addiction really starts. LOL. Good one Joe. Sigh, The concept is good for the plane storage, except that the planes are stored flat on the sole and not spaced up a bit to protect the blade. 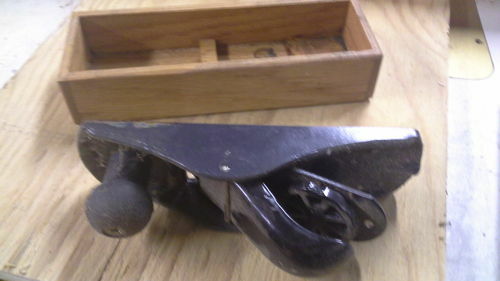 As a young apprentice it was literally beaten into me to NEVER EVER store a plane flat on the sole. On its side or in a box with a center ridge to keep the blades sharp were the only acceptable choices. There are rare earth magnets that are JB Welded into place that are NOT flush to the surface, leaving room for the blade to miss the surface. I thought you were going to mention that there was NO protection from dust, etc. etc. Thank you for your comment… Good point! Great project, Joe. I love organizational projects!! Planes where they are needed and the magnets makes them stay in place.